One of the things that I thank God for is having really good friends at work. Sometimes, when it gets tough in the workplace, these friends graciously extend their help and encourage the people around them, including me. 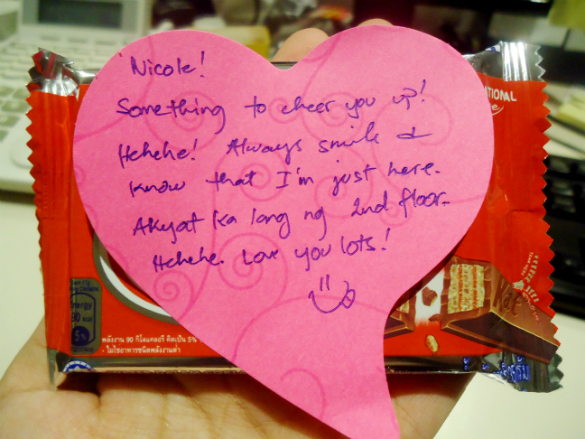 When I got to the office this morning, I found a bar of KitKat on my desk with a note from an “anonymous” person. But, because I recognized the handwriting, I knew that it was from one of my friends in the I.T. department. God used this moment to encourage me in the morning. Before I even started with my tasks for the day, He reminded me through this that there are so many things I can be grateful for in spite of seemingly unwanted circumstances in life. He encouraged me through my officemate to simply find joy in knowing the Lord and in doing my best for Him wherever, whenever. Here’s an awesome song by TobyMac. It’s called “Speak Life”.